This page documents our 2002 drifter deployment. CLICK HERE TO SEE OUR 2008 DEPLOYMENTS. In September 2002, fifteen ARGOS drifting buoys were deployed by Larson King and other residents of Mekoryuk, Nunivak Island. 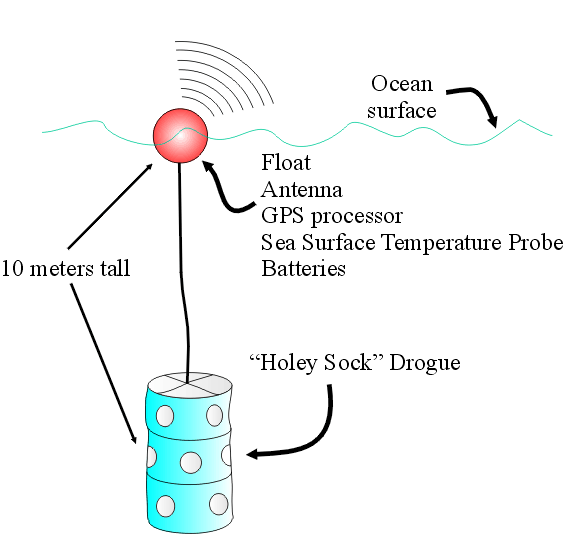 These drifters communicate their position and the sea surface temperature via satellite to the ARGOS processing center in Largo, MD. From Largo, the data are sent via email once a day to the Institute of Marine Science at the University of Alaska Fairbanks. This project is funded by the North Pacific Research Board. 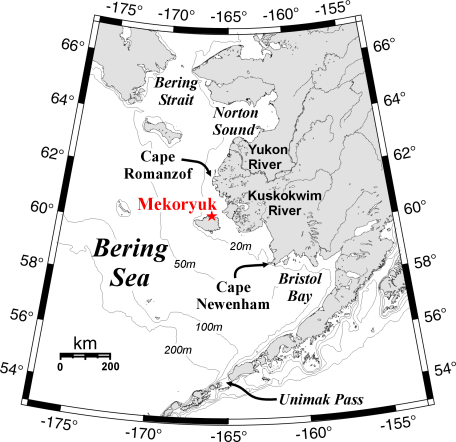 Drifter trajectories will provide information about the nearshore Bering Sea circulation to both the coastal residents of western Alaska and oceanographers interested in the Bering Sea flow field. This partnership between the scientists and the local Mekoryuk community members depends upon the technical skills in working with the drifter data at UAF as well as the logistics and field work capabilities provided by the residents of Mekoryuk. A science field program of this scope would have been considerably more costly using a dedicated science research vessel. We present here some graphical plots of the drifter data. The time series plots show latitude, longitude, and sea surface temperature (SST) plotted against time. The maps (plan views) show hourly drifter positions. Animations! We have created some movies of drifter motion: one showing tidal motion near Nunivak Island and one showing three months of daily drifter positions. Danielson, S., K. Aagaard, T. Weingartner, S. Martin, P. Winsor, G. Gawarkiewicz, and D. Quadfasel (2006), The St. Lawrence polynya and the Bering shelf circulation: New observations and a model comparison, J. Geophys. Res., 111, C09023, doi:10.1029/2005JC003268. 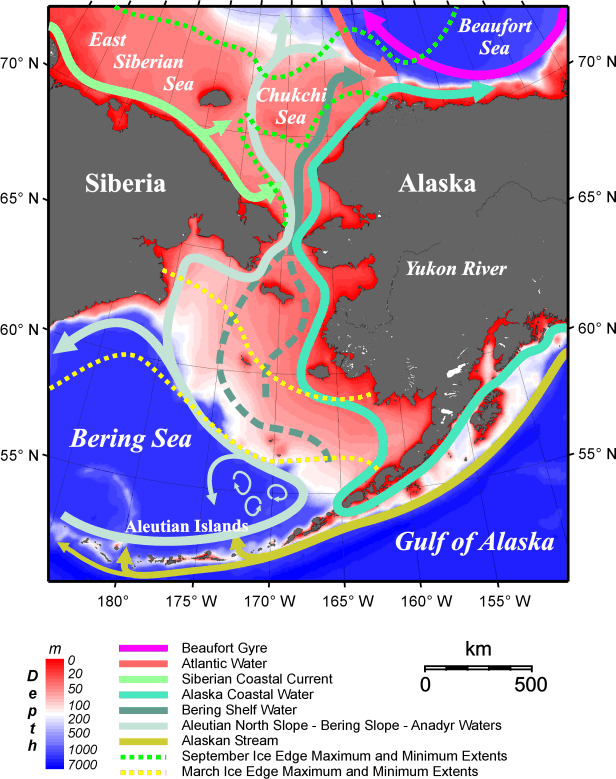 Our schematic of the ocean currents in the Bering Sea shows the typical circulation features. In addition to these mean flows there are very strong tidal currents over most of the Bering Sea continental shelf. A set of past drifter deployments can been seen here. We welcome any questions about our project and the oceanography of the region. Remotely sensed and estimated environmental views of the Bering Sea: Sea Ice, Sea Surface Temperature, Surface Winds and more. Click here to go to our photo gallery. 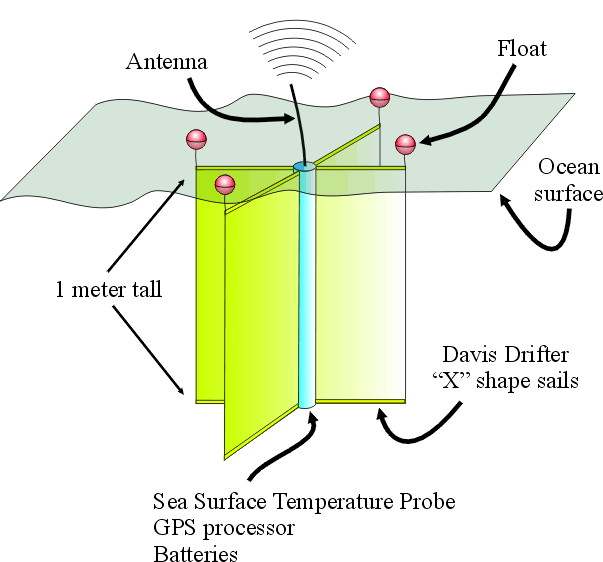 Schematics of the two types of drifters used are shown below. The CODE type drifter is a surface "Davis drifter" and the SVP drifters are "holey sock" type drifters. The CODE drifters' "X" shaped sail patterns catch the surface layer water currents like a sail catches the wind. The SVP drifters move with the waters at 10m depth. In the stormy waters of the Bering Sea, the SVP drifters appear to transmit better quality data to us.